Bill Boushka: My 1961 expulsion from William and Mary: reviewing the lessons; what about duty and "moral hazard" today? What about D.A.D.T.? My 1961 expulsion from William and Mary: reviewing the lessons; what about duty and "moral hazard" today? What about D.A.D.T.? Today (Thursday, Feb. 19, 2009) The Washington Post ran a front page story (by Joe Stephens) about the FBI investigation of MPAA president Jack Valenti back in the early 1960s, for homosexuality and other “vices”. It goes on to mention the Walter Jenkins “scandal” in LBJ’s White House, and says that allegations of homosexuality then could end a Washington career. (Friday, the Post would say that this was a "most viewed article"!) Indeed, a later Mike Wallace interview of Dean Rusk in 1967 on CBS would confirm such folly. This generation rightly wonders why this was such a big deal, beyond surface experience of “bigotry” and interpretations of religion. 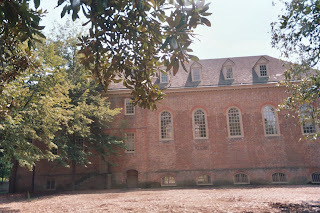 On November 28, 2006 I wrote a blog posting about the 45th “anniversary” of my own personal 9/11, my expulsion from the College of William and Mary in Williamsburg as a freshman for admitting “latent homosexuality” to the Dean of Men. Partly because of dilemmas in my own more recent circumstances, I want to walk through that event again today in more detail. My visitors know that I am quite concerned about “justice” on an individual level, and realize that in a free democracy, justice has to be tempered by the practical experience of belonging to a “community.” Perhaps that notion of justice will bring back expectations of “generativity” from everyone. Whatever the general principles, and however these moral principles should apply to me today, the story of the WM event in 1961 does speak to the issues, even if there is a significant evolution in how we would interpret this event today. I had, as a youngster, fit the stereotyped pattern of what “reparative therapists” like Joseph Nicolosi (who made an unfortunate appearance on “Dr. Phil” recently) call “the pre-homosexual boy”. I was gifted musically, with almost perfect pitch and great musical memory, and academically, even if slightly dyslexic and tending toward mild attention deficit. But on the playground I was definitely the last chosen. I remember the “No bunts except for Boushka” in grade school. My father made a lot of my learning to do “manly things” in the right form, even when there was no immediate practical consequence; I was taught that it is the duty of men to protect women and children. Young men were supposed to prove they were “good enough” in competition and “worthy” of the families that would guarantee them a place in society. This notion had moral implications (and could lead to certain contradictions): if I did not do my duty and left it to others, they might have to “sacrifice” in my place. This sort of thinking commanded a lot of attention then, during the days of the Berlin Crisis and the Cold War, with the Vietnam era draft to appear soon. I had developed a sense of modesty about my body, and in seventh grade, I recall, I did not wear short-sleeve shirts at school until June. I had become the taunt of teasing and believed that I was being eliminated from the “competition” to reproduce; I somehow did not make the “biological cut.” There were a couple of very negative episodes in seventh and ninth grades whose details need not be repeated here. High school (then starting at 10th grade) went much better, leading to my Science Honor Society membership as a senior, as well as the continuation of piano, and even some composing; I had come to develop “another way to live”, an inside-out way of looking at things that seem to avoid the “existential trap” inherent in my circumstances. Why, I wondered, wasn’t it a good thing to admire young men who were good at everything (in a way that I wasn’t)? Is it good to exalt good and promote it? Put that way, I could focus on aesthetics (even when dealing with arousal and fantasy) and avoid what the homosexuality “meant.” It did not need to be viewed as a way of reproducing potentially destructive, exclusionary ideas that we had already fought a World War over. I want to walk though some of the details of what happened that fall of 1961, and collect a few more observations to make sense of all this. Yes, I do think it would make a movie, or a docudrama: maybe a PBS Point-of-View, or maybe something much more. Let’s see what the didactic “lessons”, stemming from some inductive reasoning, are. Let’s walk this “inside out”. In the first place, William and Mary, at the time, admitted more men than women. Female students needed to reach a higher academic standard to get in. (Other Virginia state schools had their own quirks: at the University of Virginia in Charlottesville, men had to wear coat and tie to class in order to look like “gentlemen”). This practice reflected the values of the day, when only a couple years before a woman’s magazine (Ladies Home Journal, I think) had written, “Who would you rather go to college, you or your husband?” (Betty Friedan would start to change that.) Men were supposed to be excited about creatures that would become dependent on them. But as I’ve noted, already I had disconnected from the importance of having a biological lineage. I had my school, grades, and music. My “gender deficit” was “masculinity”; what would I really need women for? To the teenage brain, it was all too logical. I had no “need” for sexual complementarity. I experienced a psychological "incentive" for upward affiliation with no reason to be willing to accept and keep intimacy that flows in a "normal" direction. Nevertheless, the gender imbalance could be problematical for boys, who would have to compete for dates. Anything that threatened their sense of security could flare up and go out of control. The second point is to realize that in those days, students lived in a “non monetary” economy, controlled by their parents and by the rules of the (benevolent) Administration. Instead of dollars (or gold), the underlying currency was social prestige, grades, athletic reputation, and for some students, access to women. You can really develop some pretty interesting sci-fi about the possibility of an economy based on “karma” rather than money. It’s somewhat different today as kids have their own cars and credit cards (and maybe some of that will go away during this economic crisis). College then was a dictatorship (and not of the proletariat), but nevertheless life seems eventful and vivid and real. Things matter, just as they do to adults. There’s something else about this that strikes me now, given the College’s distant connections to Colonial Williamsburg and the American Revolution (something particularly relevant to Patrick Henry’s famous speech in Richmond). Virginia, as probably did other colonies, used multiple currencies. The third point, getting closer to what precipitated the events, is that the campus is small and the physical quarters then were cramped. It was hot that fall, well into October, with no air conditioning. (I remember the 5-cent cokes on campus well.) I shared a small, narrow room with one roommate (who wanted to be a drama major) from Roanoke: it had a bunk bed, two desks and two chests, and that was it. That would lead in more to the comparison to my situation to what happens in the US military when the subject of lifting the ban on gays came up when Bill Clinton became president in 1993. I was somewhat of an oddball, wearing bright-colored clothes but careless about “details” (pun with the well-known mag intended), about tucking in my shirttail, for example. My roommate thought I had no “pride” in my appearance but that’s not exactly true. I simply did not conform to expectations “in his space.” He was the first to bring up the subject of homosexuality because of the Liberace-like colors of some of my shirts. There were other small aggravations, and they piled up. We both had the same English teacher, a young man from Australia, but had different sections. The instructor tended to go out on a limb in interpreting poems like T.S. Elliot’s “Love Song of J. Alfred Prufrock” (the instructor talked about impotence, related to that “etherised on a table” line, which sort of reminds me of UFO abduction) and Erich Fromm’s “The Art of Loving” with all the discussions of symbiosis (which in later years I would come to associate with “polarity”). There was that first theme, which I got an A- on, that had to be a “definition” and I took up the topic of “friendship”. He read the theme and drew his own conclusions. (This was a half century before Proposition 8.) And then, I simply didn’t show up at all at the hazing sessions (called “Tribunals”), where, I heard by rumor, that “they” shaved the targeted boys’ legs. On top of that, there was the issue of music. I had befriended another freshman from California, who claimed to have composed a large body of music, and played some of it for me in the soundproofed practice rooms. I would get into discussions of music back in the dorm room, and my roommate hated some of it when it played on the clock radio (especially the opening of Brahms’s Second Symphony). Finally, there was the influence of movies. On Homecoming weekend, Warner Brothers’s famous film by Elia Kazan, “Splendor in the Grass”, with a title and plot derived from the Wordsworth poem, played. I saw it with the music friend, and the roommate saw it separately. In the film, the girl, after her mother’s rejection of her affair with Bud, winds up in a mental institution. Something like that would happen to me a year later (at NIH). Then, another provocative film, “Aimez-vous Brahms” (again) would show up at the little theater on Duke of Gloucester Street, and be provocative in its treatment of sexual morality and social disapproval. The Fourth point was that the college did not take a Thanksgiving break. I left home on September 9, and would not return until almost Christmas. We were immersed in a world controlled by others but where all the events had a lot of significance. It was on Friday after Thanksgiving that the event broke. I had been at class, including physics recitation and lab all afternoon, and returned to the dorm to find a handwritten note taped very publicly on the door, talking about room inspections and patent medicines, with directions to go see the Dean of Men immediately. I walked to his office in Wren Hall and probably met with him around 5:30 on Friday afternoon, just after dark. It seems that he had been waiting for me all afternoon on the day after Thanksgiving (although he would have known my schedule). The discussion quickly moved to my social adjustment in the dorm, and I honestly believe that was the reason for the urgency of the meeting. If it was just about a “room inspection”, why not do it on a Monday or Tuesday during a normal week. Something must have “happened” a day or so before Thanksgiving. Toward the end of the meeting I characterized myself with the term (or “pinned label”) “latent homosexual” – it may sound like an oxymoron, and I’m not sure it would meet the legal definition of “telling” even for the military today. He wanted to call my parents right away, and I gave him the name of friends they were staying with in North Carolina. He tracked them down with an operator Friday night, and I can imagine what it must have been like for them to wonder all weekend about the “worst.” I’m sure what was going through the Dean’s mind was the “death penalty” scenario (as people saw things then) of an only male child leaving his faithful parents no lineage (grandchildren). I won’t get too personal here, but as a general matter, as people saw things in those days, such a “catastrophe” could challenge a marriage seriously. But I was living in my own world (designed by the College) and had no such concept or understanding of “things.” I was still a virgin. I recall a few days before a conversation with my roommate, after dark, where he described witnessing an assault at a summer camp a year before somewhere in the mountains. He made exaggerated claims (using graphic language) of the “threat” that homosexuals pose to the reproductive capacity of “normal men.” I think he might have communicated these worries to the Dean, but possibly not told the college about witnessing the assault. It’s speculation, but if he had, maybe I wouldn’t have been called in the day after Thanksgiving. My parents showed up Monday, had a private meeting with the Dean early Tuesday, and ten gave me the bad news (“it’s going to come as a blow to you, but we have to take you out of school”). Later, my father pointed out a stain on a bedroom sheet or mattress that he thought denied what I had said. I can put all these “facts” together, and although there are some detractors and unfortunate circumstances, I can imagine what everyone was “thinking” (Dr. Phil style, again). They saw may behavior as a way of stepping on people’s toes, of fighting with my fingernails, as retaliating. But it’s worse. They saw my “choice” as a life strategy based on evading normal competition with other men and normal family and patriotic responsibility or “duty,” choosing instead to kibitz (silently but somewhat publicly "scope") the competitiveness of other men. In terms of polarities (a topic I’ve taken up elsewhere), I wanted to become “the power behind the throne” rather than right for power myself. I was “psychologically feminine” but nobody could grasp an idea like that then. I’ll add mention of a brief incident a year later when I was a “patient” in the mental health ward at the National Institutes of Health. We had a ping pong tournament, and I “won” by keeping the ball on the table and allowing less intact patients to lose control with foolish aggression (wild slams) and made them mad. The psychiatrists actually made something of my behavior. Again, at WM, was a community of young men (even compared to today’s college students) who had not yet lived and functioned in a free market economy. A work world where personal competence and responsibility mean more than collective ideas is much less threatened by psychological diversity – hence the value of libertarianism. Instead, the men’s ideas were shaped by the administration and their parents, often with religious training. Although most had experienced heterosexual urges and even “crushes”, none had any experience yet with families of their own. But they did have vague ideas that they faced monogamy and psychological “trade-in” and commitment. They probably felt that such commitment was a reasonable expectation only if everyone (including me) was going to have to play by the same rules. Despite the double standards for men and women (women in colleges often had curfews when men did not), most had some sense that a universal standard of “righteousness” was important so that everyone could behave and still save face. One process that the closed, moneyless society of a walled-off campus had exposed was that, once one draws attention to oneself within any community (whether by bright clothes or unconventional behavior on a small campus, or with high-profile blogs on a global Internet today), others rightfully question one’s “purpose” or motives. Expression is never just a soliloquy (as in “Carousel”); there is always an audience whose behavior is to be affected; there is always a motive, always an “intent.” So the existential meaning of one’s attractions (indeed, “do tell”) really do matter to other people; in my case, they matter because they at least prove that “masculinity is an achievement”—else it wouldn’t fascinate and titillate my fantasies. That lesson would come back four and a half decades later (see the July 27, 2007 blog posting). Today, I do find myself facing questions of duty and family, beyond the normal parameters of “choice” and “personal responsibility” (or even “moral hazard”) the way modern society defines it. I can understand how we can put some of the old concerns as they surfaced in the dorm (much more than in the barracks in my case) into moral questions: on a finite planet, should more resources go to those who accept uncertainty in making emotional commitments to others? These questions, while off base generally, do make sense in certain social and political contexts (last Monday’s post). I find it difficult to accept some involuntary “duty” without having had the experience of starting and raising my own family on my own terms. But that is a lesson I would learn years after William and Mary. It does seem that we are heading back toward a society where “generativity” (as part of “sustainability”) is as important a moral duty as following up on the choices one actually makes. Such a notion could have a profound effect on how we view marriage, but it is a coming thing. Although my parents gave me a “bailout” (putting me through George Washington University while living at home), there were serious social and career consequences for me because of this incident, at least severe isolation during the most important years of “young manhood”, and other psychological consequences that I have never detailed. Freedom was taken from me, and it’s fair me to want to investigate, and to know, why? What did “they” want? (As for the roommate, why didn’t the Dean of Men just separate us?) I think I’ve sketched that out here. However, I really would like to have the College investigate what happened forty-seven years ago and give me some kind of report and apology. I’d like to see its law school do some kind of public forum on the more subtle problems with justice, duty and community (the “moral hazard” debate in the financial crisis is a good starting point). I may contact LLDEF or some similar legal agent to pursue the matter soon. "Moral Hazard": How vulnerable are we all? EFF offers updated "Bloggers' Legal Guide"
"Bong Hits for Michael Phelps?" Please!